Located in Northern British Columbia, the City of Prince George is the largest northern city in British Columbia, dubbed the Northern Capital of BC. Using ArcGIS Online, the GIS department at The City of Prince George were tasked by upper management to provide insights on who was using their public facing web maps. Unable to connect Google Analytics to ArcGIS web map apps, they turned to Maptiks to get traffic data, track visitor engagement and demographic information. The City of Prince George set out to find insights into user behaviour, identify if users were visiting their web maps and adjust marketing efforts to target their residents. 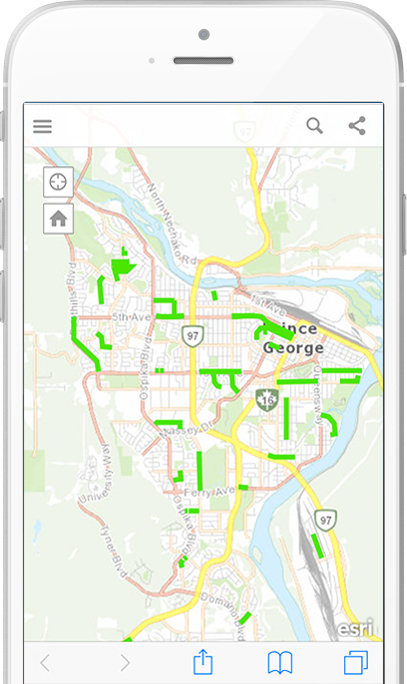 The Maptiks team helped The City of Prince George decide to move forward with single usage apps, as opposed to a multi-usage web map apps. A single usage app would allow for easier marketing, as well as a simpler and better user experience. They chose to pilot their new strategy with their annual Road Construction and Sidewalk Rehabilitation Map, which provides information on all future planned and current road and sidewalk construction for the season. The city’s external relation team, alongside the GIS department launched and marketed their Road Construction and Sidewalk Rehabilitation Map online using their website and social media in early February. With their Maptiks enabled ArcGIS Online web map, The City of Prince George tracked visitors, map usage, bounce rates and other key engagement metrics. The analytics showed a clear uptick in traffic during launch, and low bounce rates, suggesting a high level of engagement. The GIS department were able to report back to management with key performance data and useful demographic insights. Firstly, for the first two months after its launch, the web map had a low bounce rate of a 25%, and 6-10 interactions per visit. Although web map traffic subsided shortly after the first week of launch, it sustained an average of 800 loads per week thereafter. It was clear that local residents were using the web map to stay updated on the city’s construction activity. Moreover, call centre activity declined as construction inquiries were funnelled to the informative web map.